The age old ritual of the opening of parliament took place yesterday. On the first day of a new parliament session (or shortly after a new election) the queen will travel from Buckingham palace to the houses of parliament (Westminster) where her speech will outline the governments agenda for the coming year. We are used to all this pomp and ceremony here however yesterday had even greater excitement for those who lined the streets to watch the parade. 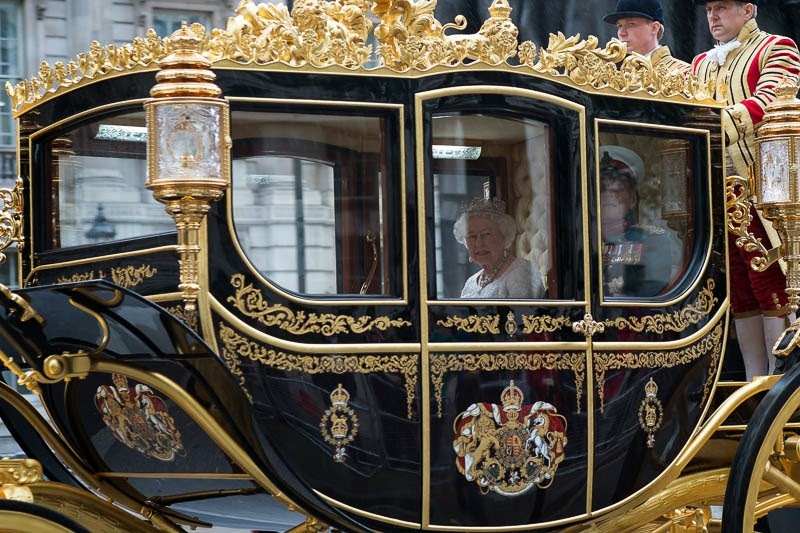 This was the unveiling of the queen's new coach. She doesn't get many new coaches, in fact this is only the second in her lifetime and this one was built by an Aussie! It is a true labour of love by Jim Frecklington that took him 10 years to build. He even mortgaged his house to help fund it. The coach features wood from Nelson's ship, hand rails from the Royal ship Britannia and 400 books of gold leaf. What makes it truly unique is that it is a thoroughly modern coach with hydraulic suspension (much more comfortable than those medieval ones), aluminium wheels, electric windows and heaters. (she can leave the cashmere rugs at home). She saw I was getting wet and offered me a ride but I declined, a bit too public for me, but I told her she looked lovely and admired her jewels, particularly the tiara. Good pic in difficult conditions. It's magnificent. That second picture is great. She's looking right at the camera! You are too polite. I would have climbed right in! A beautiful carriage, and you caught the great lady at just the right moment. Fantastic! You really can't beat these two great shots. Well done! I imagine that at their age they are rather glad of its mod cons. It's a beautiful piece of craftsmanship. 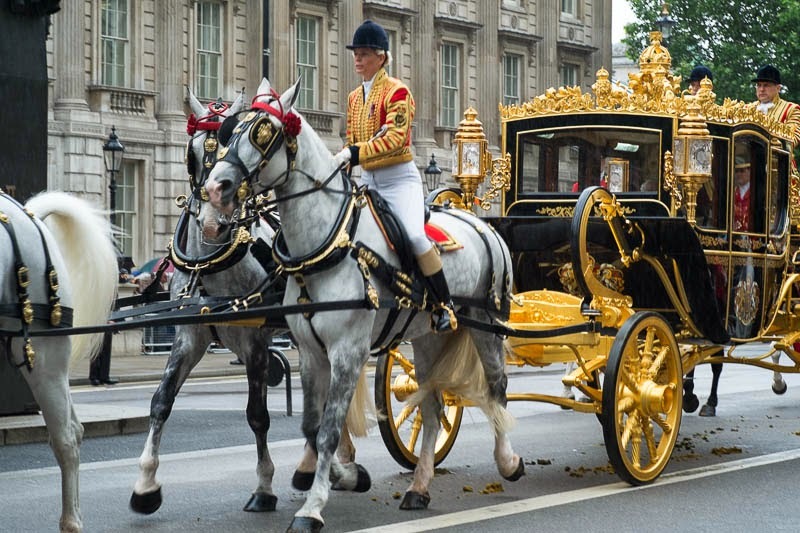 I hope it's on view in the Royal Mews, as I had thought of visiting there next time I'm in London with my granddaughter. She keeps her transportation a lot longer than I do. The coach is beautiful, but I am not an aficionado of royal coaches and can't compare it with its predecessor. Your photos are excellent. Wasn't it just an eentsy weentsy bit exciting to capture a photo of the queen looking directly at you? Great shot!!! Very interesting to know what was used in the making, thanks.